With hearts of love and gratitude for our mother, Hilda Mary (Crandall) Horsman, we released her in her 97th year into the loving care of Her Saviour and Heavenly Father on April 15, 2019. Hilda was a resident of Peoples Park Tower and passed away peacefully within the comforts of her home. Born in Shaw Brook on July 31, 1922, Hilda was the daughter of the late William and Ada (Dryden) Crandall. She became the loving wife of H. Russell Horsman, and they had 59 years together. Hilda was a current member of the Sunny Brae Baptist Church and the Women’s Missionary Society, a past member of the Trustee Board, Visitation Committee, and the Pastoral Search Committee. She was a volunteer with the Christian Food Bank, a Christian Women’s Club speaker, and a Stonecroft Bible Study leader. 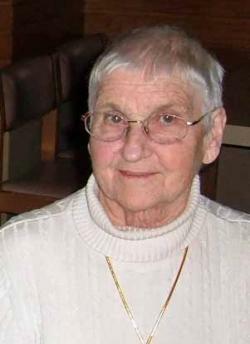 Hilda served in Pioneer Clubs and on the Pioneer National Board. She was a quilter, knitter, an avid reader, enjoyed word puzzles, time spent with her family. In addition to her parents, Hilda was predeceased by her husband, Russell; infant son, Wayne; sisters, Helen, Hazel, and Helena; half-sisters, Bertha, Ella, Mina and Hattie; brothers, Hardy, Herman, infant twin brothers, Howard and Henry, and half-brother Ralph; daughter-in-law, Joanne Horsman and step grandson, David Carter. Left with many precious memories are Hilda’s sons, Gordon (Marianne), Kenn and Jerry (Allana) Horsman; her daughters, Linda (Paul) Wellwood and Sharon (Vernon) Vickruck. Hilda’s legacy of love and compassion includes her grandchildren and great-grandchildren, whom she adored: Debie (Scott), Aidan and McLean Mealey; Bethany (Paul), Grace, Duncan, and Ruthie Osborne; Jonathan (Renee), Claire, Anja and Henry Horsman; David (Janet), Elijah, Ezekiel, Noah, Phoebe and Ellie Horsman; Vicki (Jason), Emily, Janelle, and Juliana Bettle; Joni (Drew), Eliava, Isaiah, and Carissa Mersereau; Sheri (Matt), Clara and Kaitlyn Taylor; Shawn (Melanie), Gabriella, Judah, Caleb and Micah Horsman; Chris (Alanna), Abigail and Clara Wellwood; Melody (Paul), Trey and Ty Davis; Rebekah (Stephen), Kalia, Lilyana, Laney and Russell Page; Rachael Wellwood; Andrew (Jenn), Lauren and Leah Vickruck; Matthew (Jillian), and Anita Vickruck; Michael (Ashley) Vickruck; step-grandchildren: Elisabeth (Michael) French; Stephen (Cheryl), Anna and Sophie Carter. Hilda’s family express sincere appreciation to the Personal Support Workers of Peoples Park Tower and the Driscoll Extra Mural team for going above and beyond in the care of our mother. Visitation will be held at Fergusons Funeral Home, 1657 Mountain Road, Moncton (858-1995) on Wednesday, April 17 from 5:00 to 9:00 pm. A fragrance-free service will be held in the Funeral Home Chapel on Thursday, April 18, 2019 at 3:00 pm, with Rev. Colin Cook leading the service. Interment will be in Birch Hill Cemetery, Berry Mills, later in the spring. Memorial donations would be gratefully received by: Friends of The Moncton Hospital (Burn Unit), Sunny Brae Baptist Church Building Fund or a charity of your choice. Family flowers only, please.